Who Else Is Ready To Get Master Resell Rights To This Brand Spankin' New Christmas Package, With Graphics That Will Blow Away Your Customers, Incredible Content, A COMPLETE Resellers Kit And Enough Cash For Your Whole Family To Start Believing In Santa Claus Again?" This Christmas Package will give you the opportunity to make tons of Cash and turn you into Santa Himself or....You can just give the money to the poor! With the collection of Christmas items below; graphics, fast cash ideas, children stories, recipes, and so much more, you really stand the best chance online this season to make some fast cash! 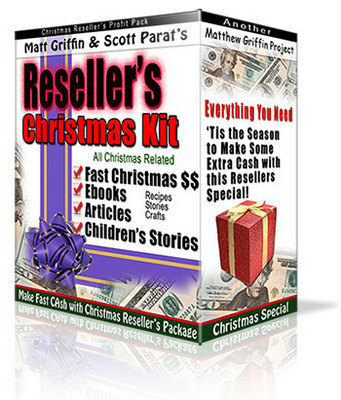 And with the resellers kit, professional sales page, thank you page, and spectacular graphics to boot? Who needs any other products out there right now? 50 Christmas childrens stories for you to share with your loved ones! "BIG BOOK OF CLASSIC CHRISTMAS TALES"
including 35 Christmas tales and stories with complete Private Label rights! Christmas Cookie Recipes, with hundreds of cookie recipes to choose from or to combine to make your own traditional cookie for your family and friends. Earning FAST Christmas Cash report that gives you many ways and ideas to generate holiday income on the GO! 12 Super Christmas, Professional minisite graphics (see below for examples) that you can immediately put to use with your content! A copy of this sales page! Professional Graphics (alone worth the price of this package ten times over) with incorporated flash for 'flashy' graphics that catch your readers attention! Christmas Night Mini Site. Complete with header, footer, order button, small book and large book graphics with background! Christmas Wreath Mini Site, complete with header, footer, order button, small book and large book graphics with background! Christmas Candles Mini Site, complete with header, footer, order button, small book and large book graphics with background! Happy Snowman Mini Site, complete with header, footer, order button, small book and large book graphics with background! Christmas Bows Mini Site, complete with header, footer, order button, small book and large book graphics with background! Elegant Holly Mini Site, complete with header, footer, order button, small book and large book graphics with background! Snowman Snowglobe Mini Site, complete with header, footer, order button, small book and large book graphics with background! Santa & Sleigh Mini Site, complete with header, footer, order button, small book and large book graphics with background! Christmas Tree Mini Site, complete with header, footer, order button, small book and large book graphics with background! Santas List Mini Site, complete with header, footer, order button, small book and large book graphics with background! Sants With Presents Mini Site, complete with header, footer, order button, small book and large book graphics with background! Sants With Money Bags Mini Site, complete with header, footer, order button, small book and large book graphics with background! You Have A Unique Opportunity, because this has never been offered to the public, EVER before right now! Jump on board and get your copy so that you can start making money 20 minutes from now! Plus you will have all of this unique content to spicen up your holiday season with your loved ones!